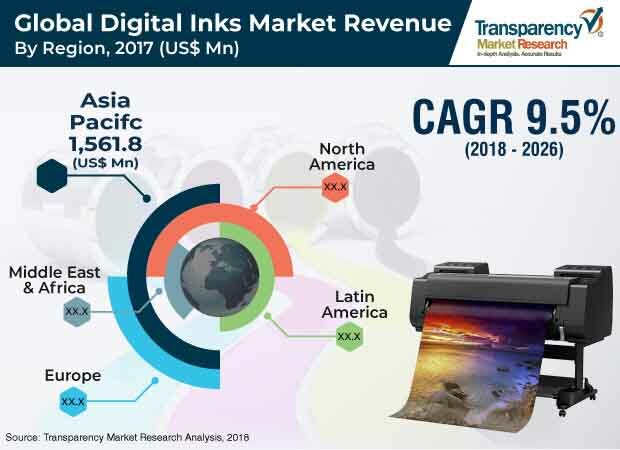 The global digital inks market was valued at US$ 10.0 Bn in 2017 and is projected to expand at a CAGR of 9.5% from 2018 to 2026, according to a new report published by Transparency Market Research (TMR) titled ‘Digital Inks Market – Global Industry Analysis, Size, Share, Growth, Trends, and Forecast, 2018–2026.’ Growth of the advertising & promotion industry is expected to augment the demand for digital inks between 2018 and 2026. Increase in textile digital printing and rapid urbanization in emerging countries are estimated to boost the global digital inks market from 2018 to 2026. Significant growth of the textile industry in developing economies and rise in use of sustainable inks are boosting the adoption of digital inks. The textile industry in Asia Pacific has expanded at a rapid pace in the last few years. This trend is projected to continue during the forecast period. Rapid digitization and increasing changes in the fashion industry in developing countries are driving the digital inks market. Rising demand for low VOC emitting inks from various end-use industries such as packaging, textile, and others, is fueling UV-cured and water-based inks segments. This, in turn, is projected to fuel the digital inks market during the forecast period. Need for high quality, on-demand printing, and high speed printing is estimated to propel the digital inks market in the near future. The global digital inks market has been segmented based on formulation, substrate, application, and region. The water-based segment held a major share of the global market in 2017 owing to the high demand for low emission and cost effective inks from various packaging and textile manufactures. Furthermore, stringent regulations of government pertaining to protective environment regulations increases the demand of water-based inks. The UV-cured segment is expanding at a substantial pace during the forecast period, as these offer high productivity and superior printing throughput. UV-curable inks possess numerous features and functionalities which make them suitable for specialized printing needs. For instance, UV-curable inks are used to print on rigid surfaces and on polyethylene billboards. They can also be used on metals, glass, ceramics, textiles, and other substrates. Quick drying and high ink saturation features of UV-curable inks increase their requirement in niche applications. This, in turn, is driving the UV-cured segment. The advertising & promotion segment is projected to hold a major share of the global digital inks market during the forecast period. Digital inks, especially inkjet printers, have been widely used in advertising media and promotional activities applications in the last few years. Their adoption is increasing in textile application owing to their superior properties and significant qualities. Significant rise in the advertising media and textile digital print applications is projected to create opportunities for players operating in the digital inks market. Furthermore, ceramics and glass printing segments are anticipated to create lucrative opportunities for digital inks manufacturers in the next few years. The digital inks market in Asia Pacific is likely to expand at a significant pace during the forecast period. Rising consumption of UV-cured inks in developing economies such as India, China, Vietnam, and Indonesia is expected to create lucrative opportunities to digital inks manufacturers in the next few years owing to rapid urbanization, growth in population, expansion of the textile industry, and rise in the number of packaging and advertising applications. Additionally, increase in digitization in matured markets such the U.S. Canada, and Germany is projected to create lucrative opportunities in the digital inks market in the region during the forecast period. The report provides profiles of leading players operating in the global digital inks market such as INX International Ink Co., Toyo Ink Co., Ltd., Sun Chemical, Cabot Corporation, Siegwerk Druckfarben AG & Co. KgaA, Wikoff Color Corporation, Marabu GmbH & Co. KG, Nutec digital Ink, Nazdar, and Kornit Digital Ltd. Several companies operating in the global digital inks market engage in the expansion of digital inks portfolio by improving existing products and developing new products that have superior features. They strategically enter into long-term agreements with textile, packaging, and advertising contractors to increase their market share.